Weekends are a great time for relaxing, reading, or spending time with loved ones. 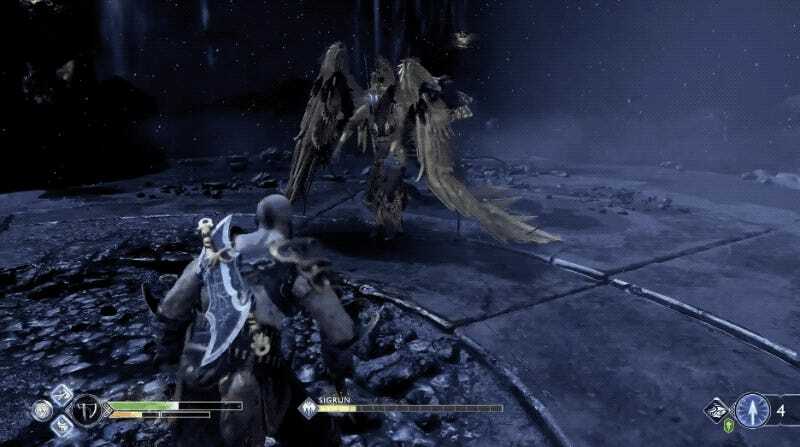 Or, if you’re me, you can spend an entire weekend trying to beat the Valkyrie Queen in God of War. Valkyrie fights are among the more straightforward of the many challenges in Sony Santa Monica’s fantastic Nordic murder-fest. Each one is a head-to-head boss battle against a raging, possessed winged warrior. Each one is difficult, and each one is slightly different. As you explore Midgard, you’ll find eight Valkyrie arenas. Some are hidden, some are sitting in plain sight. Each Valkyrie awaits you in her arena, and each employs distinct moves. Beat all eight of them, and you’ll unlock a final fight against Sigrun, the Valkyrie Queen. I fought, and eventually defeated, Sigrun back in April. It was one of the most arduous and challenging boss battles I’ve ever encountered in a video game. Yet on reflection, it was also such a well-designed battle that I think more people should give it a shot. 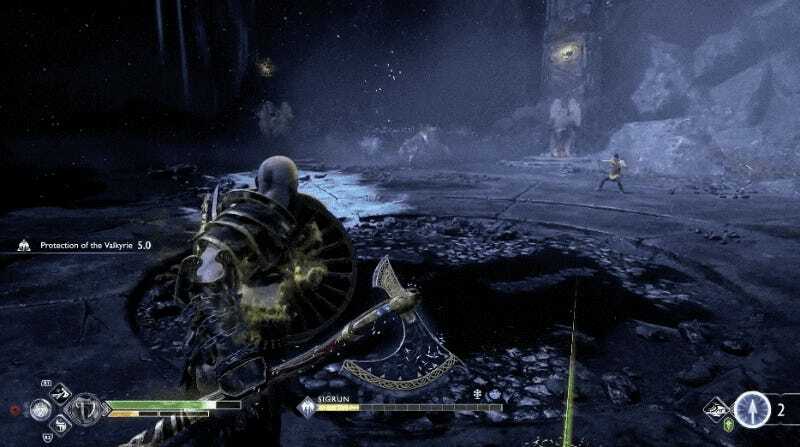 In the wake of the grueling Radiance fight in Hollow Knight, the toughest things I faced in Monster Hunter World, and my ongoing replay of Bloodborne, I’ve been thinking more and more about difficult boss fights. Feels like it’s time to go back to the Sigrun fight and look at what makes it tick. 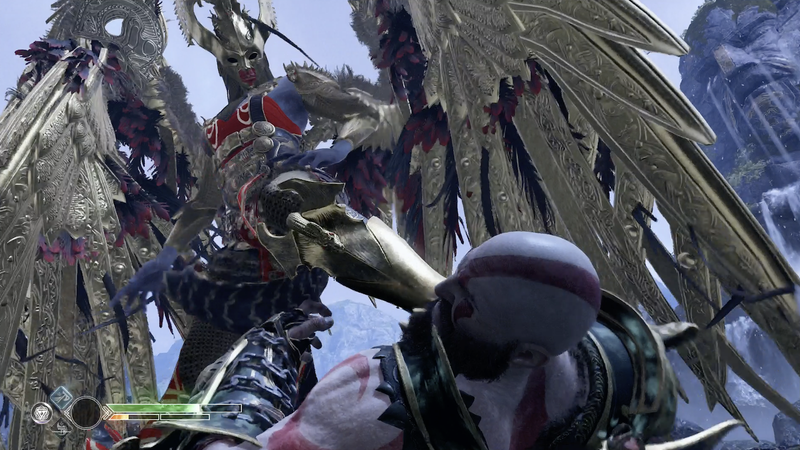 It starts with a big F U.
Kratos’ attacks do hilariously little damage. It barely moves. 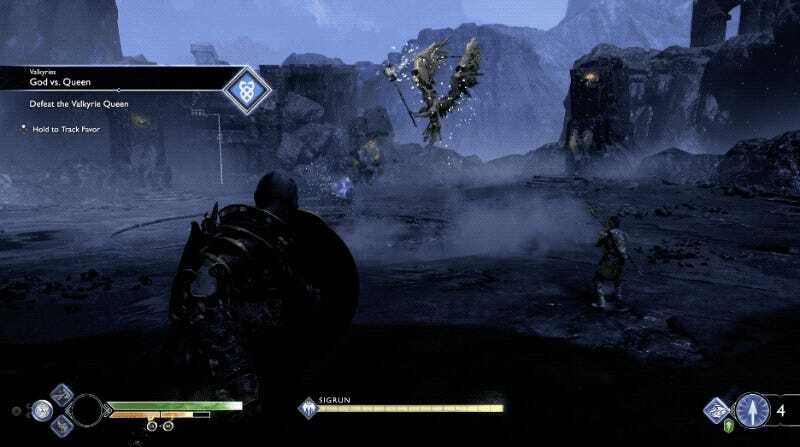 Sigrun’s many-segmented health bar is massive, and even if you think you’ve landed a devastating combination of melee and runic attacks, you’ll usually hardly make a dent. Sigrun’s attacks, however, do tons of damage. One minute, I had been doing fine. I had half health and was in a defensive position. 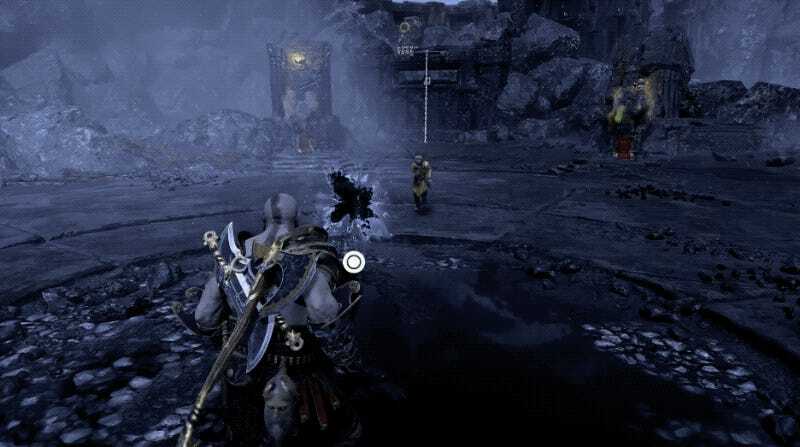 Then I failed to dodge a simple red lunging attack, which is both one of Sigrun’s simplest attacks and, given its short windup, one of the hardest to dodge. As I’m recovering from the hit, she leaps up to go into her unblockable dive-bomb attack, and I screw up the timing on my dodge. All at once, it’s game over. 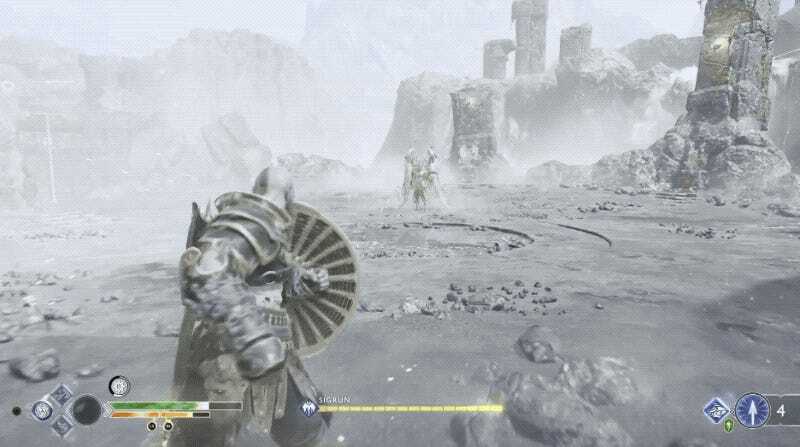 Throughout my fight with Sigrun I was wearing some of the best armor in the game, and I was only playing on Normal difficulty. Even then, her attacks were so ludicrously strong that a single screw-up could turn an otherwise flawless fight into failure. She has loads of different attacks and constantly changes patterns. That’s two vital aspects of the fight that could be said of a lot of difficult boss fights—her attacks do a ton of damage, and your attacks do little damage. There’s little room for error, so you have to play cautiously and defensively, only attacking at a few key moments of opportunity. The wimpiness of your attacks extends the length of the fight and leaves many, many opportunities for error. I blew it a couple times after getting Sigrun’s health bar down to its segments, all because I got excited and thought I could burn her down faster than I could. Those last bits may look like a relatively small part of her health bar, but they’re actually enough for her to absorb several more combos while getting off a dozen or more attacks of her own. The third part of the difficulty triangle is the variety of Sigrun’s move-set. At my count, she has around 16 different possible attacks. Here they are, broken into a few sub-categories. A pair of standard wing attacks transitioning into a spinning attack. 4. Closed wing turtle to open pushback. A not-that-rare example of a ranged attack quickly becoming an unblockable close attack followed by a closed-wing turtle. 7. Long-range meteor attack w/ flaming aftermath. 8. Ice-blast attack w/ unblockable follow-up. A classic flying scythe rush. 10. Unblockable blinding dazzle attack, with follow-up. An Aerial Damaging Shockwave, which does an absurd amount of damage. Nailed by a Swooping Dive-Bomb after a mistimed roll. 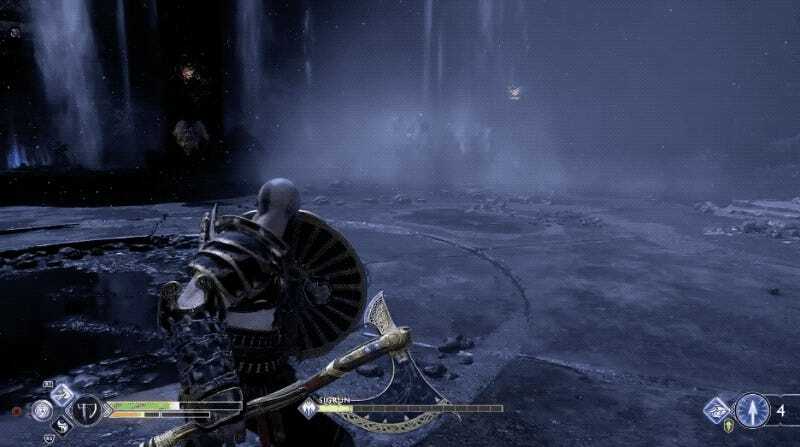 Kratos is a beefy, slow-moving guy. He can run, and he has a few semi-ranged attacks. He’s also got Atreus, whose arrows can interrupt Sigrun’s worst area-of-attack spells. But by and large he’ll have to get up close to do damage, and most of his best non-runic attacks have a lengthy windup period. Sigrun is ridiculously fast in comparison. She can cross the entire arena in a fraction of a second. She can escape combat and zoom to the far side of the arena, then close that distance for a heavy attack, all in about a second and a half. She’s hard to stagger, and recovers terrifyingly quickly. She combines her attacks in unpredictable ways, and a couple of them have ridiculously short telegraphs. I had her staggered with a runic attack, and then she was just gone. If I’d used the quick turnaround button, I could’ve been ready to block her follow-up. I didn’t, and she ate most of my health before I even saw what was going on. That kind of stuff happens all the time in this fight. You can’t get comfortable or greedy, because Sigrun can turn things around in the blink of an eye. And yet, I really think you should try this fight if you haven’t. After all that, you might think that I’d tell you to avoid fighting Sigrun. 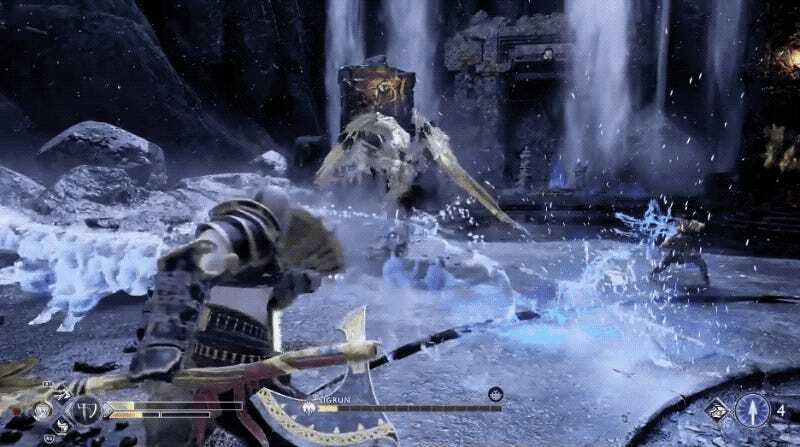 But I actually feel the opposite: the Sigrun fight is the toughest thing in God of War, but it’s absolutely worth your time. 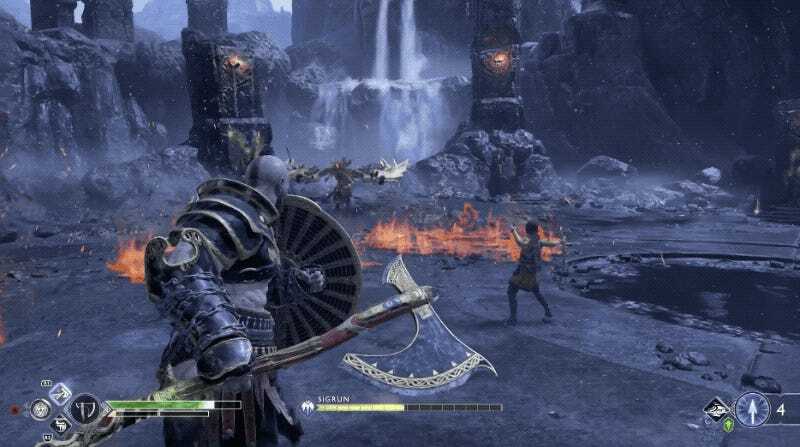 Each of God of War’s three side activities is a worthy challenge, and each tests you in a different way. The fire realm of Muspelheim tests your abilities against standard combat mobs, with a variety of twists and modifiers. The mist realm of Niflheim combines exploration skills with combat and resource management. And the Valkyrie fights are pure tests of combat prowess. 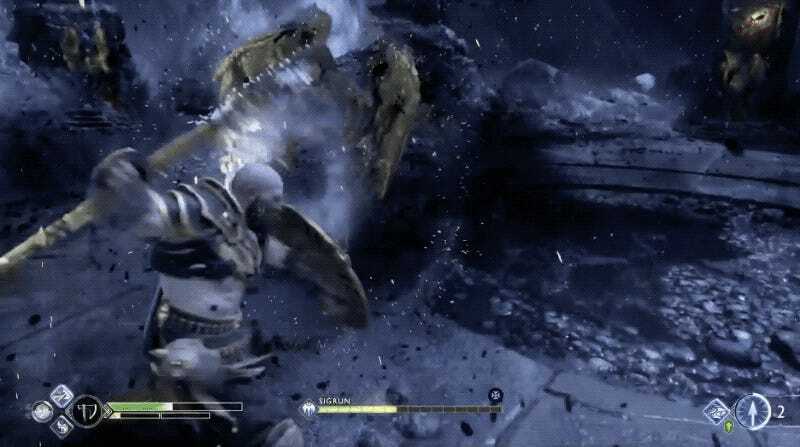 I’m guessing that a fair number of people played through most of God of War, finished the story, maybe dabbled in the optional stuff, then left the toughest challenges—like the Sigrun fight—incomplete. If that’s you, take the opportunity to dust the game off, return to Midgard, and hop into the ring with the Valkyrie Queen. You can do it. I believe in you.